Travel from Flagstaff to the Grand Canyon on a full-day tour to witness this famously beautiful landscape in Arizona. Your guide takes you on a driving tour along 23 miles of the East Rim and South Rim, with plenty of stops for photo ops from the best vantage points. 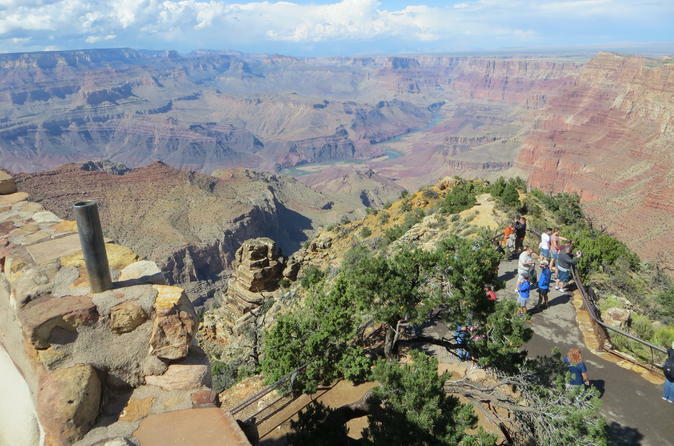 Enjoy lunch in Grand Canyon National Park and have time for a short walk or souvenir shopping. You’ll also stop at an historic trading post in the Navajo Nation, where you can shop for Native American jewelry and crafts. After morning pickup from your Flagstaff hotel, travel through the gorgeous mountains surrounding Flagstaff and some of Arizona's most scenic landscapes. Arrive at the Grand Canyon's South Rim after about 1.5 hours on the road. 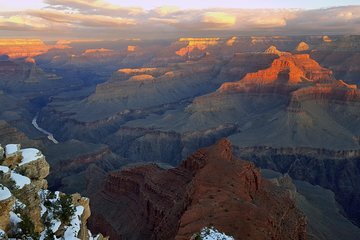 Pause to take in your first views of the vast canyon from a viewpoint on the rim, then continue along the 23-mile drive that skirts the rim of the Grand Canyon. This driving tour is the main event of the day, with incredible views of the canyon at every turn and endless photo ops. Stop at viewpoints along the way, and learn about the Grand Canyon's geology, wildlife and history from your guide. You'll visit spots on the East Rim and South Rim, where Grand Canyon Village is located. The rim tour takes about two hours, then stop for lunch at a restaurant on the rim. Afterward, have time to take a short nature walk or browse the souvenir shops before continuing along your drive. As you leave the canyon, pass through part of the large Navajo Nation and stop at the historic Cameron Trading Post, an authentic Navajo trading post. Browse the Native American arts and jewelry for sale, and hear more about the Navajo people. Your tour winds down with a drive across the Navajo reservation, where you can see the Painted Desert and the Little Colorado River Gorge in the distance. Finally you'll return through the mountains to Flagstaff, where your tour ends with drop-off at your hotel in the early evening. This was my first time to the Grand Canyon and I am go happy I took this tour. Smokey our tour guide is extremely knowledgeable about the Grand Canyon, the National Park system, the history of Arizona and the Native Americans and the local culture. The van was comfortable and we spent the day experiencing the beautiful scenery. This package included lunch which was delicious. If I go back to the Grand Canyon, I will definitely book a tour with this company and request Smokey. Worth every penny.... great value. This was our first time to the Grand Canyon so I knew we needed to do a tour to see as much as possible. Our tour guide was Lynn Sine and she was awesome. She's been doing this for 11 years and was full of historical and geological information. She had the best personality for a tour guide and took us to all of her favorite spots. I appreciated being picked up and dropped off at our hotel as I got to enjoy all of the scenery. She gave us plenty of time at each stop to get breathtaking photos, pick up souvenirs, or eat. There is also plenty of water provided and you definitely need it. We loved this tour and highly recommend it. I hope you get Lynn as your guide! The perfect way to see the Grand Canyon is on this tour. Our guide, Kathryn , was so informative and pleasant. She brought us to the most breathtaking sites and never made us feel hurried. Highly recommend it. Highly recommended. Adding the Indian Reservation and other sites really was educational. Also this tour avoids a lot of the hustle and bustle of the tourist crowds. Tour guide was informative, entertaining, and was sure to pick memorable spots for photos. Tim Munson was a wealth of knowledge and made the trip a true pleasure. I also want to compliment him on assisting with my wife who was handicapped from recently surgical procedures. Our recent tour of Grand Canyon and the Navajo Indian Reservation was amazing thanks to our dedicated tour guide Chris. He provided so many back stories about what we were seeing to enrich our vacation experience. The blending of siteseeing and history lesson was truly magical. Thanks again Chris and keep up the wonderful story telling. My husband took a tour of the Grand Canyon and Navajo Indian Reservation. Our tour guide, Lynn, was so enthusiastic and knowledgeable, the time just flew by. Lunch at Cameron was very good. You have got to try the Navajo Taco. And then there was the Grand Canyon... Lynn knew all the good lookouts and noted points of interest. Seeing the Grand Canyon was awesome. In that we were there off season we were able to get to the lookouts for photos easily without a crowd. .Just an incredible and excellent tour with guide Lynn. Thank you! This tour is perfect for anyone who doesn't want the hassle of finding a parking spot or getting lost. Our guide Brian was very nice and dropped us off at all the right places while he found a parking spot. He then joined us and gave us the highlights of that location along with secret trails we would have never found on our own. He gave us his cell phone number in case we got separated from the group and gave us plenty of time on our own to explore a little. Lunch was great.